Throw pillows are an easy way to liven up a boring living room or bedroom. All you need to do is toss them onto the bed or sofa to instantly add a splash of color and personality to your décor. They're even better if they feature designs that are near and dear to your heart. 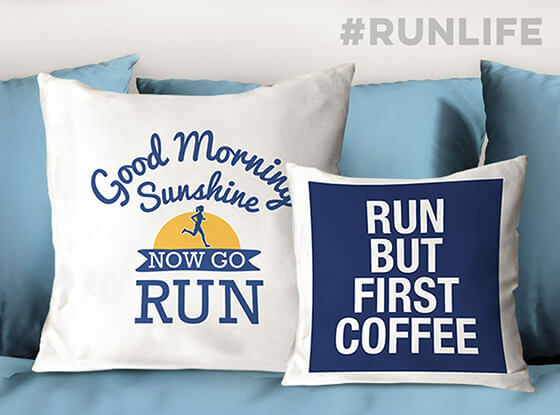 Improve your home décor while showing off your passion for running with the selection of decorative pillows for runners from Gone For a Run. Relaxing with these pillows is the perfect way for any runner to recover after his or her daily miles. Each one of our running pillows is made from plush and comfortable materials and is printed with one of our original running designs. Our runner's throw pillows feature a two-part design. The first part is a white polyester, zippered pillowcase that has been printed with running-inspired artwork and text. The second is a faux down pillow insert, which gives these throw pillows a luxurious feel. Being separated into two parts makes these running pillows much easier to clean than they would be if they didn't have a removable pillowcase. Whenever you need to wash them, simply unzip the cover and toss it into the washing machine. Our throw pillows for runners come in two different sizes: 16 inches square and 24 inches square. Mix and match different sizes and designs to create an interesting look in your décor. Browse our large selection of different running pillow designs to find the perfect option for you. 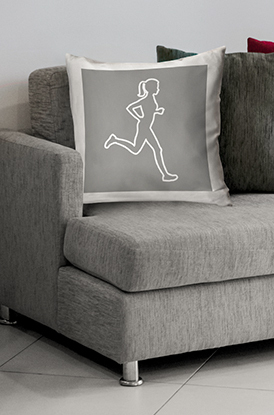 Both girls and guys that like to run will be sure to love our runner girl and runner guy pillows. Any mom who has experienced the joy of running with a baby in a stroller will enjoy our runner mom pillows. Some pillows feature running quotes and run mantras to keep you motivated. Let the world know what your latest race accomplishment is with our race distance pillows. Choose from marathon, half marathon, triathlon, cross country and track and field pillows. Our race city pillows help you celebrate your favorite running destinations. You can also decorate for your favorite holiday with our seasonal pillows for runners.